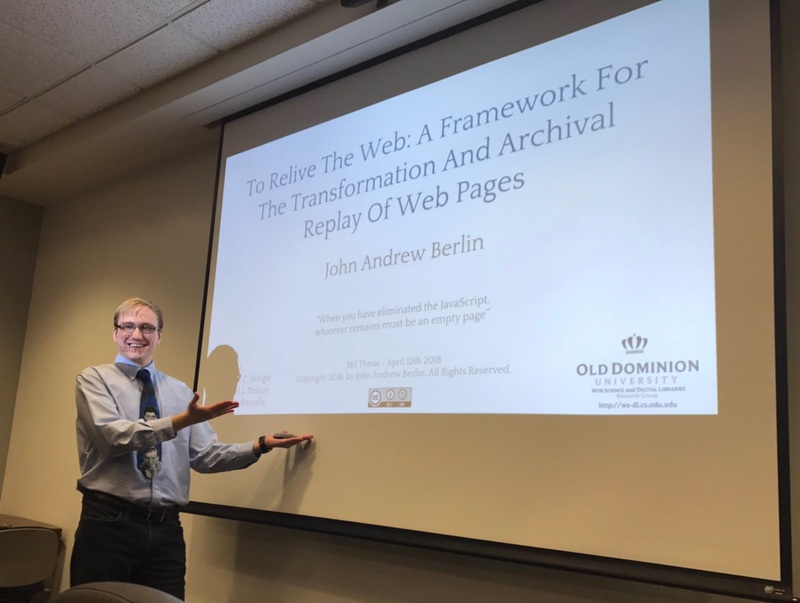 Thus my thesis was born and is titled "To Relive The Web: A Framework For The Transformation And Archival Replay Of Web Pages". The existing styles of replaying mementos from web archives is broken down into two distinct models, namely "Wayback" and "Non-Wayback", and each has its own distinct styles. For the sake of simplicity and length of this blog post I will only (briefly) cover the replay styles of the "Wayback" model. Non-sandboxing replay is the style of replay that does not separate the replayed memento from the archive-controlled portion of replay, namely the banner. This style of replay is considered the OG (original gangster) way for replaying mementos simply because it was, at the time, the only way to replay mementos and was introduced by the Internet Archive's Wayback Machine. 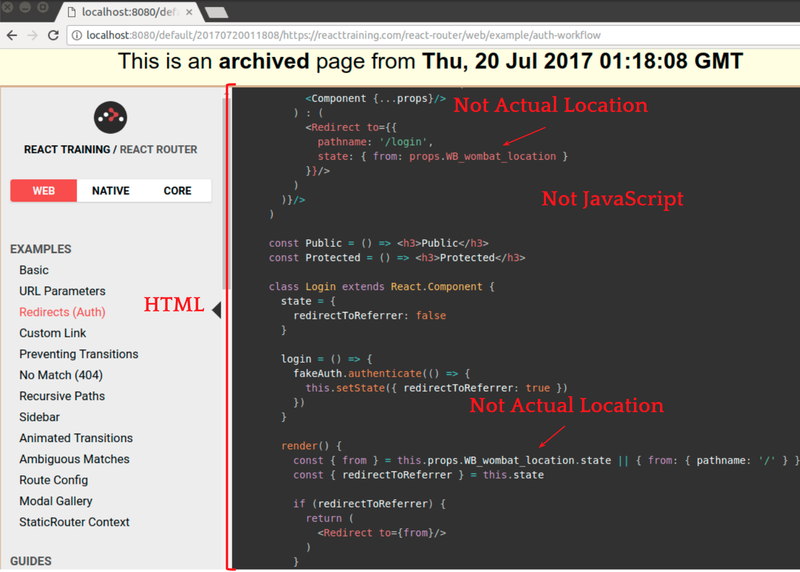 To both clarify and illustrate what we mean by "does not separate the replayed memento from archive-controlled portion of replay", consider the image below displaying the HTML and frame tree for a http://2016.makemepulse.com memento replayed from the Internet Archive on October 22, 2017. 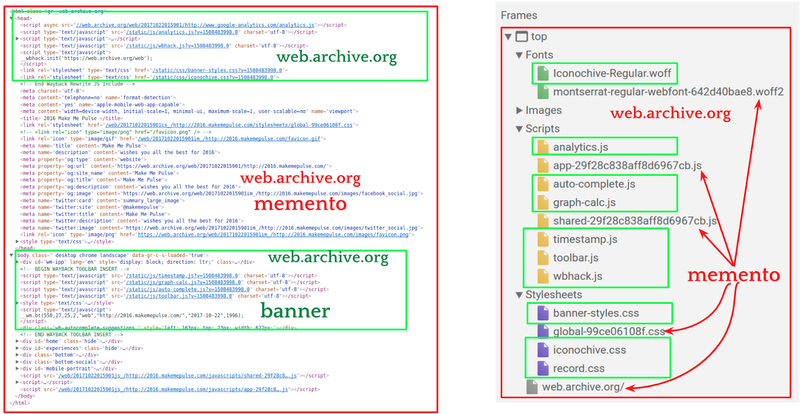 As you can see from the image above, the archive's banner and the memento exist together on the same domain (web.archive.org). Implying that the replayed memento(s) can tamper with the banner (displayed during replay) and or interfere with archive control over replay. 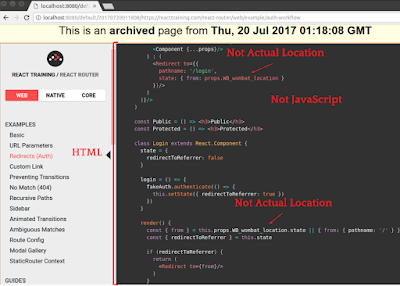 Non-malicious examples of mementos containing HTML tags that can both tamper with the banner and interfere with archive control over replay skip to the Replay Preserving modifications section of post. Now to address the recent claim that "memento(s) were hacked in the archive" and its correlation to non-sanboxing replay. Additional discussion on this topic can be found in Dr. Michael Nelson's blog post covering the case of blog.reidreport.com and in his presentation for the National Forum on Ethics and Archiving the Web (slides, trip report). Sandboxed replay is the style of replay that separates the replayed memento from the archive-controlled portion of the page through replay isolation. 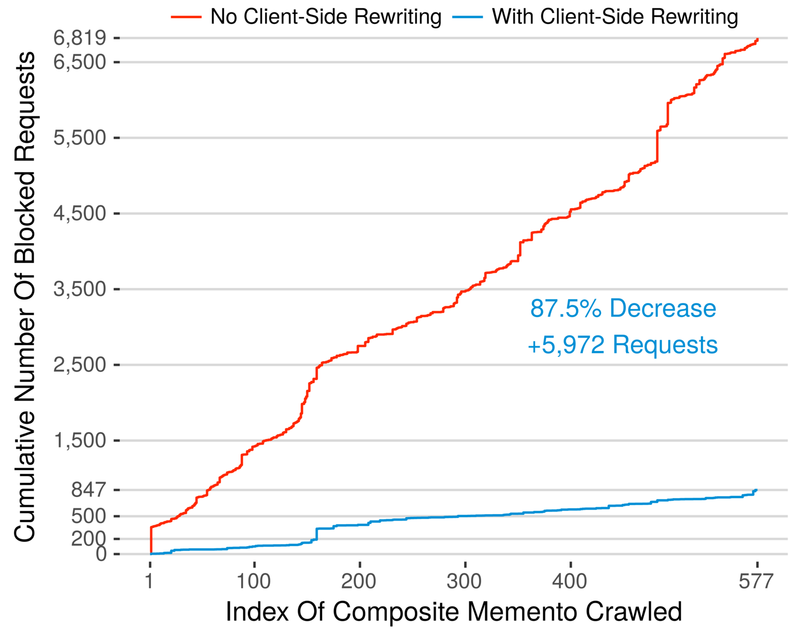 Replay isolation is the usage of an iframe to the sandbox the replayed memento, replayed from a different domain, from the archive controlled portion of replay. Because replay is split into two different domains (illustrated in the image seen below), one for the replay of the memento and one for the archived controlled portion of replay (banner), the memento cannot tamper with the archives control over replay or the banner. Due to security restrictions placed on web pages from different origins by the browser called the Same Origin Policy. Web archives employing sandboxed replay typically also perform the memento modification style known as Temporal Jailing. This style of replay is currently employed by Webrecorder and all web archives using Pywb (open source, python implementation of the Wayback Machine). For more information on the security issues involved in high-fidelity web archiving see the talk entitled Thinking like a hacker: Security Considerations for High-Fidelity Web Archives given by Ilya Kreymer and Jack Cushman at WAC2017 (trip report), as well as, Dr. David Rosenthal's commentary on the talk. 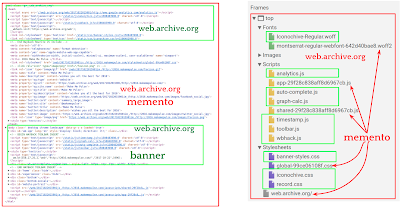 The modification made by web archives to mementos in order to facilitate there replay can be broken down into three categories, the first of which is Archival Linkage. URL rewriting (archival linkage modifications) ensures that you can relive (replay) mementos, not from the live web, but from the archive. Hence the necessity and requirement for this kind of memento modifications. However, it is becoming necessary to seemingly damage mementos in order to simply replay them. 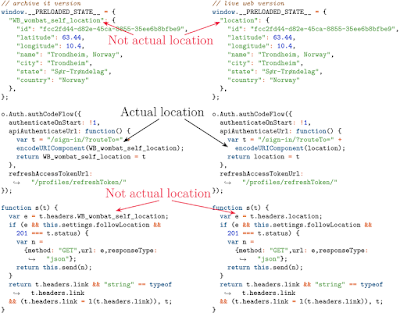 Replay Preserving Modifications are modifications made by web archives to specific HTML element and attribute pairs in order to negate their intended semantics. To illustrate this, let us consider two examples, the first of which was introduced by our fearless leader Dr. Michael Nelson and is known as the zombie introducing meta refresh tag shown below. As you are familiar, the meta refresh tag will, after 35 seconds, refresh the page with the "?zombie=666" appended to original URL. When a page containing this dastardly tag is archived and replayed, the results of the refresh plus appending "?zombie=666" to the URI-M causes the browser to navigate to a new URI-M that was never archived. To overcome this archives must arm themselves with the attribute prefixing shotgun in order to negate the tag and attribute's effects. A successful defense against the zombie invasion when using the attribute prefixing shotgun is shown below. Now let me introduce to you a new more insidious tag that does not introduce a zombie into replay but rather a demon known as the meta csp tag, shown below. Naturally, web archives do not want web pages to be delivering their own Content-Security-Policies via meta tag because the results are devastating, as shown by the YouTube video below. Readers have no fear, this issue is fixed!!!! I fixed the meta csp issue for Pywb and Webrecorder in pull request #274 submitted to Pywb. I also reported this to the Internet Archive and they promptly got around to fixing it. 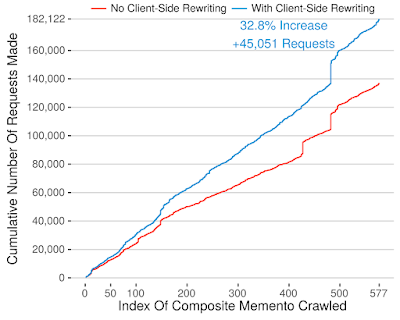 Ok so I generated a client-side rewriter for the Internet Archive's Wayback Machine using the code that is now Emu and crawled 577 Internet Archive mementos from the top 700 web pages found in the Alexa top 1 million web site list circa June 2017. The crawler I wrote for this can be found on GitHub . 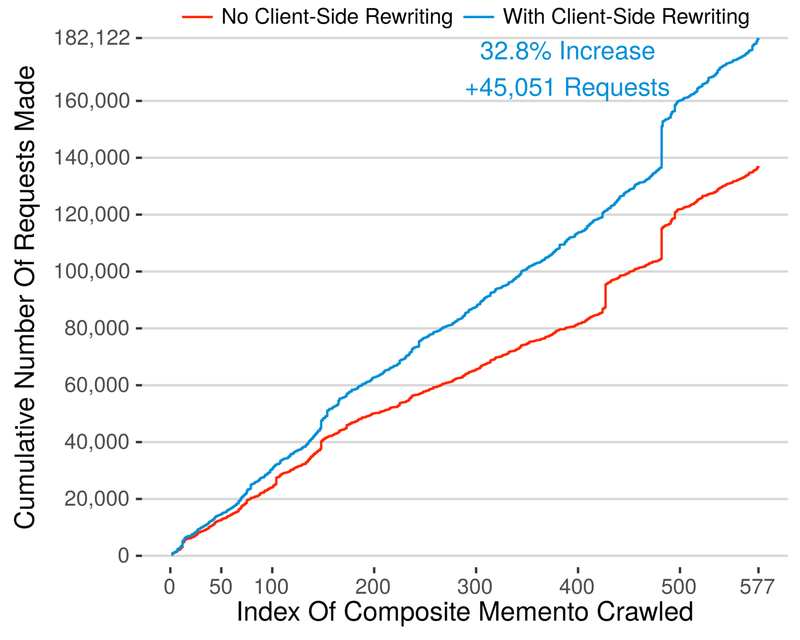 By using the generated client-side rewriter I was able to increase the cumulative number of requests made by the Internet Archive mementos by 32.8%, a 45,051 request increase (graph of this metric shown below). Remember that each additional request corresponds to a resource that previously was unable to be replayed from the Wayback Machine. Hey look, I also decreased the number of requests blocked by the content-security policy of the Wayback Machine by 87.5%, a 5,972 request increase (graph of this metric shown below). 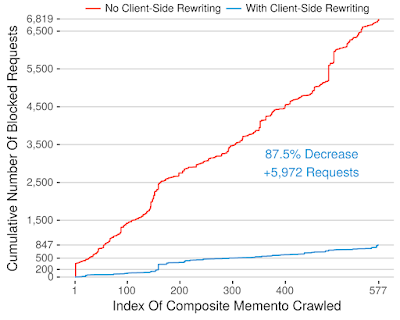 Remember, that earch request un-blocked corresponds to a URI-R the Wayback Machine could not rewrite server-side and requires the usage of client-side rewriting (Pywb and Webrecorder are using this technique already). Now you must be thinking this impressive to say the least, but how do I know these numbers are not faked / or doctored in some way in order to give a client-side rewriting the advantage??? Well you know what they say seeing is believing!!! The generated client-side rewriter used in the crawl that produced the numbers shown to you today is available as the Wayback++ Chrome and Firefox browser extension! Source code for it is on GitHub as well. And oh look, a video demonstrating the increase in replay fidelity gained if the Internet Archive were to use client-side. Oh, I almost forgot to mention that at the 1:47 mark in the video I make mementos of cnn.com replayable again from the Internet Archive. Winning!! Memgator Bulk TimeMap Downloader: Have you ever had a need to download 100 or 1 million TimeMaps using Memgator? With the caveat that it must be done in a timely manner? If so then you are in luck because this project has you covered. What is next you may ask??? Well I am going to be taking a break before I start down the path known as a Ph.D. Why??????? To become the senior backend developer for Webrecorder of course! There is so so much to be learned from actually getting my hands dirty in facilitating high-fidelity web archiving such that when I return, I will have a much better idea of what my research's focus should be on. If I have said this once, I have said this a million times. When you use a web browser in the preservation process, there is no such thing as an un-archivable web page! Long live high-fidelity web archiving! 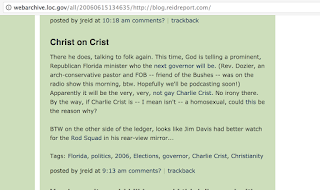 This past December, Reid’s lawyers contacted us, asking to have archives of the blog (blog.reidreport.com) taken down, stating that “fraudulent” posts were “inserted into legitimate content” in our archives of the blog. Her attorneys stated that they didn’t know if the alleged insertion happened on the original site or with our archives (Reid’s claim regarding the point of manipulation is still unclear to us). At some point after our correspondence, a robots.txt exclusion request specific to the Wayback Machine was placed on the live blog. That request was automatically recognized and processed by the Wayback Machine and the blog archives were excluded, unbeknownst to us (the process is fully automated). The robots.txt exclusion from the web archive remains automatically in effect due to the presence of the request on the live blog. 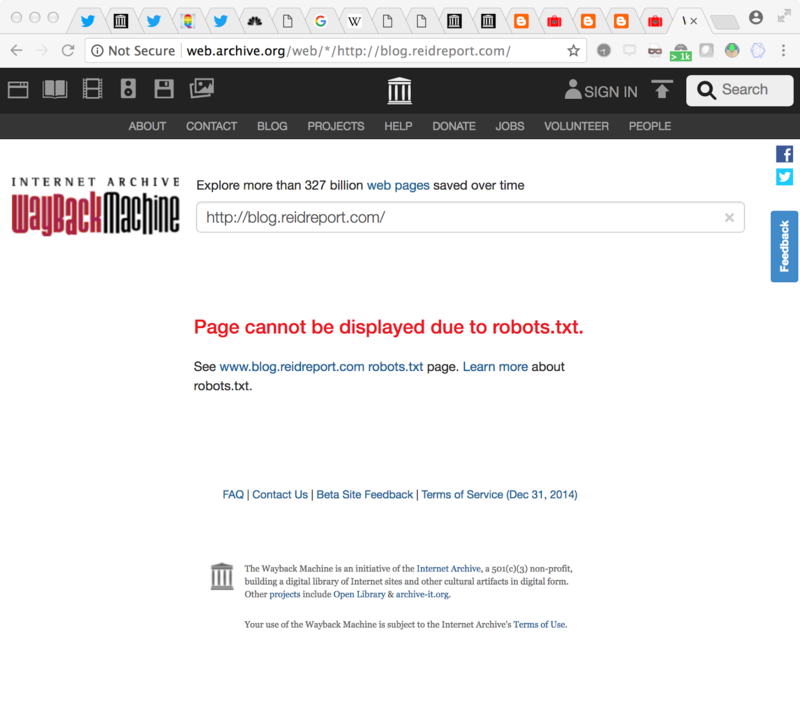 Checking the Internet Archive for robots.txt, we can see that on 2018-02-16 blog.reidreport.com had a standard robots.txt page that blocked the admin section of WordPress, but by 2018-02-21 they had a version that blocked all robots, and as of today (2018-04-24) they had a version that specifically blocked only the Internet Archive's crawler ("ia_archiver"). 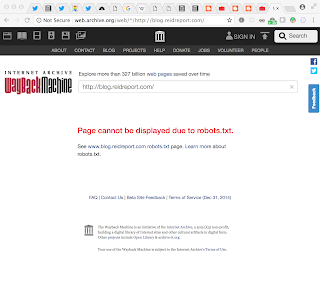 As of about 5pm EDT, the robots.txt file had been removed (probably because of the Internet Archive's blog post calling out the presence of the robots.txt; cf. a similar situation in 2013 with the Conservative Party in the UK), but it may take a while for the Internet Archive to register its absence. 2018-04-25 update: Thanks to Peter Sterne for pointing out that www.blog.reidreport.com/robots.txt still exists, even though blog.reidreport.com/robots.txt does not. They technically can be two different URLs though the convention is for them to canonicalize to the same URL (which is what the Wayback Machine does). HTTP session info provided below, but the summary is that robots.txt is still in effect and the need for other web archives is still paramount. 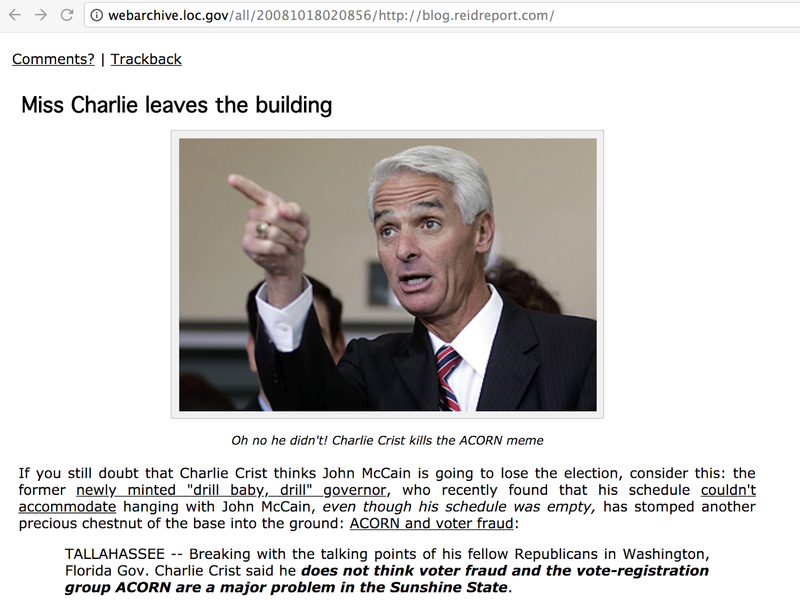 Until the Internet Archive begins serving blog.reidreport.com again, this is a good time to remind everyone that there are web archives other than the Internet Archive. 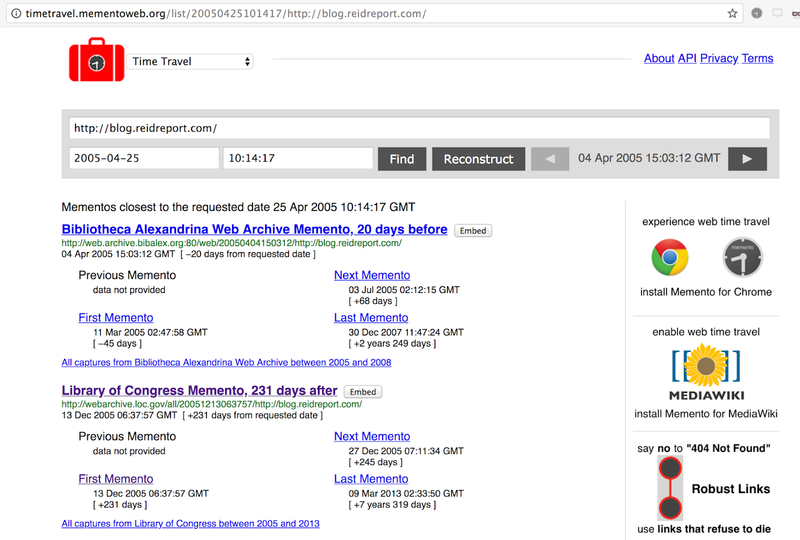 The screen shot above shows the Memento Time Travel service, which searches about 26 public web archives. 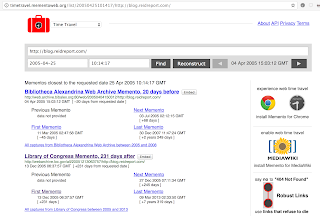 In this case, it found mementos (i.e., captures of web pages) in five different web archives: Archive-It (a subsidiary of the Internet Archive), Bibliotheca Alexandrina (the Egyptian Web Archive), the National Library of Ireland, the archive.is on-demand archiving service, and the Library of Congress. For a machine readable service, below I list the TimeMap (list of mementos) generated by our MemGator service; the details aren't important but it is the source of the URLs that will appear next. Most of those dates are pretty early in web archiving times, when the Internet Archive was the only archive commonly available, and many (all?) of the mementos in other web archives were surely originally crawled by the Internet Archive, even if on a contract basis (e.g., for the Library of Congress). Nonetheless, with multiple copies geographically and administratively dispersed throughout the globe, an adversary would have had to hack multiple web archives and alter their contents (cf. lockss.org), or have hacked the original site (blog.reidreport.com) approximately 12 years ago for adulterated pages to have been hosted at all the different web archives. While both scenarios are technically possible, they are extraordinarily unlikely. While we don't know the totality of the hacking claims, we can offer three archived web pages, hosted at the Library of Congress web archive (webarchive.loc.gov), that corroborate at least some of the claims @Jamie_Maz. 30/x Joy seemed very interested in Brokeback Mountain, but wouldn't watch it bc it featured two men hooking up. 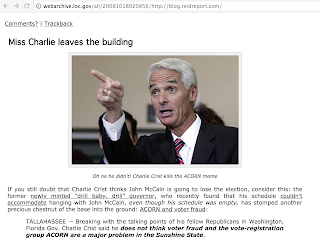 10/x Of course there are even more posts about Charlie Crist. In summary, of the many examples that @Jamie_Maz provides, I can find five copies in the Library of Congress's web archive. These crawls were probably performed on behalf of the Library of Congress by the Internet Archive (for election-based coverage); even though there are many different (and independent) web archives now, in 2006 the Internet Archive was pretty much the only game in town. 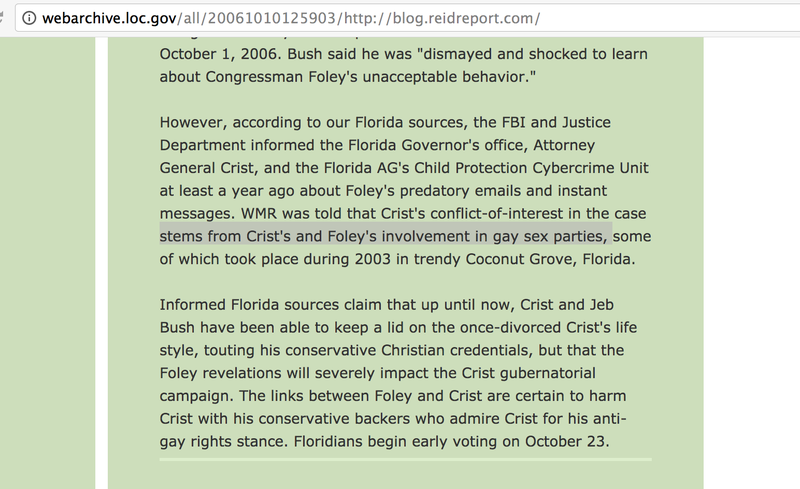 Even though these mementos are not independent observations, there is no plausible scenario for these copies to have been hacked in multiple web archives or at the original blog 10+ years ago. There may be additional evidence in the other web archives, but I haven't exhaustively searched them. We don't know the full details of what Reid's lawyers alleged, so perhaps there are details that we don't know. But the analysis from the Internet Archive crawl engineers, plus evidence in separate web archives suggest that the claim has no merit. 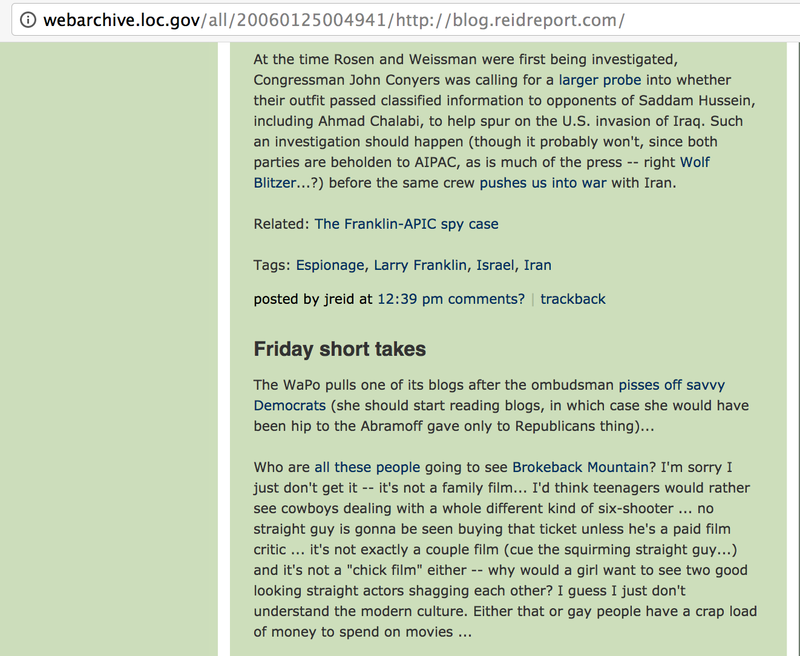 The case of blog.reidreport.com is another example of why we need multiple web archives. Thanks to Prof. Michele Weigle and John Berlin for bringing this issue to my attention and uncovering some of the examples. 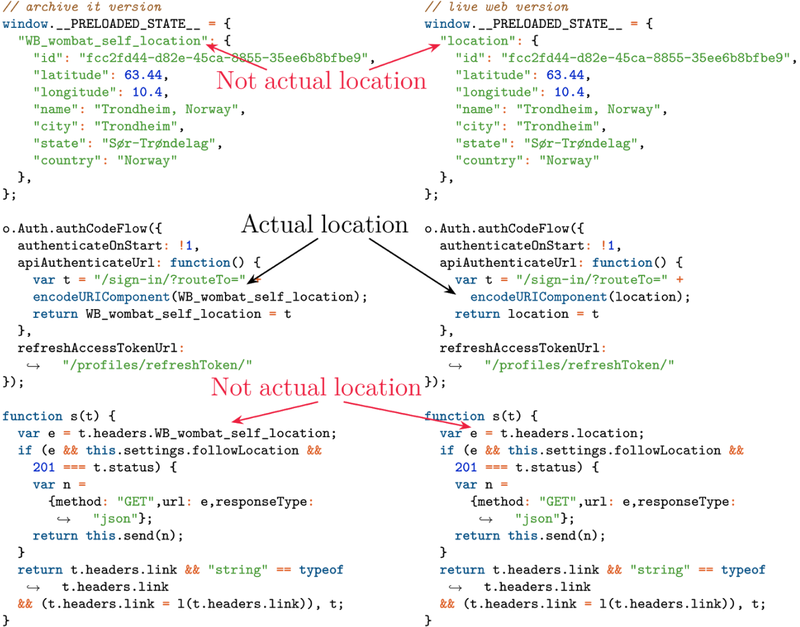 % curl -i https://memgator.cs.odu.edu/timemap/link/http://blog.reidreport.com/ HTTP/1.1 200 OK Access-Control-Allow-Origin: * Access-Control-Expose-Headers: Link, Location, X-Memento-Count, X-Generator Content-Type: application/link-format Date: Tue, 24 Apr 2018 20:39:32 GMT X-Generator: MemGator:1.0-rc7 X-Memento-Count: 174 Transfer-Encoding: chunked ; rel="original", ; rel="self"; type="application/link-format", ; rel="first memento"; datetime="Tue, 13 Dec 2005 06:37:57 GMT", ; rel="memento"; datetime="Tue, 27 Dec 2005 07:11:34 GMT", ; rel="memento"; datetime="Mon, 09 Jan 2006 23:38:24 GMT", ; rel="memento"; datetime="Wed, 11 Jan 2006 22:17:38 GMT", ; rel="memento"; datetime="Fri, 13 Jan 2006 22:17:54 GMT", ; rel="memento"; datetime="Tue, 17 Jan 2006 04:00:21 GMT", ; rel="memento"; datetime="Wed, 25 Jan 2006 00:49:41 GMT", ; rel="memento"; datetime="Mon, 30 Jan 2006 21:27:07 GMT", ; rel="memento"; datetime="Tue, 07 Feb 2006 04:37:23 GMT", ; rel="memento"; datetime="Tue, 14 Feb 2006 02:11:36 GMT", ; rel="memento"; datetime="Fri, 02 Jun 2006 12:01:19 GMT", ; rel="memento"; datetime="Thu, 08 Jun 2006 14:40:33 GMT", ; rel="memento"; datetime="Thu, 15 Jun 2006 13:46:35 GMT", ; rel="memento"; datetime="Thu, 15 Jun 2006 13:46:35 GMT", ; rel="memento"; datetime="Fri, 29 Sep 2006 09:35:09 GMT", ; rel="memento"; datetime="Tue, 10 Oct 2006 12:59:03 GMT", ; rel="memento"; datetime="Thu, 19 Oct 2006 21:33:57 GMT", ; rel="memento"; datetime="Sun, 19 Nov 2006 12:46:09 GMT", ; rel="memento"; datetime="Tue, 19 Dec 2006 12:28:32 GMT", ; rel="memento"; datetime="Tue, 02 Jan 2007 04:08:34 GMT", ; rel="memento"; datetime="Sun, 14 Jan 2007 01:52:13 GMT", ; rel="memento"; datetime="Sun, 13 May 2007 09:35:53 GMT", ; rel="memento"; datetime="Mon, 17 Dec 2007 22:54:56 GMT", ; rel="memento"; datetime="Sun, 13 Jan 2008 23:01:46 GMT", ; rel="memento"; datetime="Thu, 14 Feb 2008 15:34:40 GMT", ; rel="memento"; datetime="Fri, 29 Aug 2008 14:53:25 GMT", ; rel="memento"; datetime="Thu, 04 Sep 2008 17:09:37 GMT", ; rel="memento"; datetime="Sat, 13 Sep 2008 11:06:33 GMT", ; rel="memento"; datetime="Mon, 22 Sep 2008 19:57:42 GMT", ; rel="memento"; datetime="Fri, 26 Sep 2008 15:47:52 GMT", ; rel="memento"; datetime="Thu, 02 Oct 2008 22:37:53 GMT", ; rel="memento"; datetime="Thu, 09 Oct 2008 21:02:02 GMT", ; rel="memento"; datetime="Sat, 18 Oct 2008 02:08:56 GMT", ; rel="memento"; datetime="Sun, 26 Oct 2008 03:28:23 GMT", ; rel="memento"; datetime="Sat, 01 Nov 2008 23:14:44 GMT", ; rel="memento"; datetime="Fri, 07 Nov 2008 19:08:50 GMT", ; rel="memento"; datetime="Fri, 14 Nov 2008 19:29:33 GMT", ; rel="memento"; datetime="Sat, 29 Nov 2008 22:26:46 GMT", ; rel="memento"; datetime="Fri, 07 Aug 2009 19:22:02 GMT", ; rel="memento"; datetime="Sun, 06 Sep 2009 03:43:48 GMT", ; rel="memento"; datetime="Mon, 23 Nov 2009 07:26:35 GMT", ; rel="memento"; datetime="Mon, 23 Nov 2009 07:26:35 GMT", ; rel="memento"; datetime="Tue, 08 Jun 2010 13:09:17 GMT", ; rel="memento"; datetime="Wed, 08 Sep 2010 15:06:01 GMT", ; rel="memento"; datetime="Wed, 08 Sep 2010 15:06:01 GMT", ; rel="memento"; datetime="Sun, 17 Oct 2010 18:08:28 GMT", ; rel="memento"; datetime="Thu, 21 Oct 2010 20:44:35 GMT", ; rel="memento"; datetime="Sat, 23 Oct 2010 14:39:57 GMT", ; rel="memento"; datetime="Sat, 23 Oct 2010 14:39:57 GMT", ; rel="memento"; datetime="Fri, 29 Oct 2010 01:03:31 GMT", ; rel="memento"; datetime="Thu, 04 Nov 2010 23:39:18 GMT", ; rel="memento"; datetime="Thu, 11 Nov 2010 20:52:48 GMT", ; rel="memento"; datetime="Thu, 18 Nov 2010 12:52:39 GMT", ; rel="memento"; datetime="Thu, 25 Nov 2010 13:04:03 GMT", ; rel="memento"; datetime="Thu, 02 Dec 2010 21:13:57 GMT", ; rel="memento"; datetime="Fri, 03 Dec 2010 22:33:09 GMT", ; rel="memento"; datetime="Fri, 03 Dec 2010 22:33:09 GMT", ; rel="memento"; datetime="Sat, 04 Dec 2010 13:00:37 GMT", ; rel="memento"; datetime="Fri, 10 Dec 2010 22:04:16 GMT", ; rel="memento"; datetime="Fri, 10 Dec 2010 22:04:16 GMT", ; rel="memento"; datetime="Sat, 18 Dec 2010 02:25:03 GMT", ; rel="memento"; datetime="Sat, 25 Dec 2010 01:14:55 GMT", ; rel="memento"; datetime="Sat, 01 Jan 2011 10:29:29 GMT", ; rel="memento"; datetime="Sun, 02 Jan 2011 12:42:25 GMT", ; rel="memento"; datetime="Mon, 10 Jan 2011 19:21:23 GMT", ; rel="memento"; datetime="Sat, 15 Jan 2011 14:10:29 GMT", ; rel="memento"; datetime="Sat, 29 Jan 2011 08:10:21 GMT", ; rel="memento"; datetime="Mon, 31 Jan 2011 23:54:56 GMT", ; rel="memento"; datetime="Wed, 02 Feb 2011 02:23:38 GMT", ; rel="memento"; datetime="Sat, 05 Feb 2011 15:35:52 GMT", ; rel="memento"; datetime="Tue, 08 Feb 2011 00:21:06 GMT", ; rel="memento"; datetime="Sat, 19 Feb 2011 17:35:53 GMT", ; rel="memento"; datetime="Fri, 04 Mar 2011 21:33:16 GMT", ; rel="memento"; datetime="Sun, 06 Mar 2011 07:40:27 GMT", ; rel="memento"; datetime="Mon, 07 Mar 2011 14:47:06 GMT", ; rel="memento"; datetime="Thu, 10 Mar 2011 14:05:43 GMT", ; rel="memento"; datetime="Fri, 11 Mar 2011 19:27:05 GMT", ; rel="memento"; datetime="Mon, 21 Mar 2011 17:02:36 GMT", ; rel="memento"; datetime="Thu, 24 Mar 2011 21:38:16 GMT", ; rel="memento"; datetime="Tue, 29 Mar 2011 05:31:24 GMT", ; rel="memento"; datetime="Wed, 30 Mar 2011 17:00:39 GMT", ; rel="memento"; datetime="Wed, 06 Apr 2011 22:31:19 GMT", ; rel="memento"; datetime="Thu, 14 Apr 2011 01:19:42 GMT", ; rel="memento"; datetime="Sat, 16 Apr 2011 10:08:48 GMT", ; rel="memento"; datetime="Wed, 20 Apr 2011 15:45:44 GMT", ; rel="memento"; datetime="Wed, 27 Apr 2011 20:17:27 GMT", ; rel="memento"; datetime="Wed, 04 May 2011 13:59:20 GMT", ; rel="memento"; datetime="Fri, 20 May 2011 04:52:29 GMT", ; rel="memento"; datetime="Fri, 27 May 2011 18:39:51 GMT", ; rel="memento"; datetime="Thu, 02 Jun 2011 13:53:15 GMT", ; rel="memento"; datetime="Wed, 08 Jun 2011 09:00:12 GMT", ; rel="memento"; datetime="Fri, 10 Jun 2011 11:36:20 GMT", ; rel="memento"; datetime="Wed, 15 Jun 2011 13:11:17 GMT", ; rel="memento"; datetime="Wed, 22 Jun 2011 11:38:49 GMT", ; rel="memento"; datetime="Sat, 02 Jul 2011 04:01:34 GMT", ; rel="memento"; datetime="Wed, 06 Jul 2011 23:17:37 GMT", ; rel="memento"; datetime="Wed, 13 Jul 2011 17:30:24 GMT", ; rel="memento"; datetime="Thu, 21 Jul 2011 09:26:04 GMT", ; rel="memento"; datetime="Thu, 28 Jul 2011 20:50:32 GMT", ; rel="memento"; datetime="Fri, 29 Jul 2011 09:24:10 GMT", ; rel="memento"; datetime="Thu, 04 Aug 2011 05:48:17 GMT", ; rel="memento"; datetime="Fri, 05 Aug 2011 15:26:39 GMT", ; rel="memento"; datetime="Thu, 11 Aug 2011 05:19:14 GMT", ; rel="memento"; datetime="Thu, 11 Aug 2011 05:24:15 GMT", ; rel="memento"; datetime="Wed, 17 Aug 2011 22:56:34 GMT", ; rel="memento"; datetime="Wed, 24 Aug 2011 09:54:45 GMT", ; rel="memento"; datetime="Sat, 10 Sep 2011 22:09:09 GMT", ; rel="memento"; datetime="Sun, 27 Nov 2011 12:49:34 GMT", ; rel="memento"; datetime="Mon, 28 Nov 2011 19:08:33 GMT", ; rel="memento"; datetime="Thu, 16 Feb 2012 19:11:31 GMT", ; rel="memento"; datetime="Fri, 10 Aug 2012 23:51:03 GMT", ; rel="memento"; datetime="Sat, 18 Aug 2012 05:12:23 GMT", ; rel="memento"; datetime="Fri, 24 Aug 2012 00:36:55 GMT", ; rel="memento"; datetime="Thu, 30 Aug 2012 03:12:37 GMT", ; rel="memento"; datetime="Wed, 05 Sep 2012 21:26:20 GMT", ; rel="memento"; datetime="Thu, 20 Sep 2012 04:39:05 GMT", ; rel="memento"; datetime="Fri, 28 Sep 2012 20:54:35 GMT", ; rel="memento"; datetime="Fri, 05 Oct 2012 09:02:12 GMT", ; rel="memento"; datetime="Fri, 12 Oct 2012 14:26:52 GMT", ; rel="memento"; datetime="Tue, 06 Nov 2012 21:45:50 GMT", ; rel="memento"; datetime="Tue, 13 Nov 2012 21:34:24 GMT", ; rel="memento"; datetime="Thu, 22 Nov 2012 03:51:16 GMT", ; rel="memento"; datetime="Wed, 28 Nov 2012 01:26:55 GMT", ; rel="memento"; datetime="Thu, 06 Dec 2012 07:38:47 GMT", ; rel="memento"; datetime="Sat, 08 Dec 2012 10:48:25 GMT", ; rel="memento"; datetime="Sun, 09 Dec 2012 11:25:53 GMT", ; rel="memento"; datetime="Wed, 12 Dec 2012 15:21:12 GMT", ; rel="memento"; datetime="Wed, 19 Dec 2012 20:15:42 GMT", ; rel="memento"; datetime="Sat, 22 Dec 2012 08:35:28 GMT", ; rel="memento"; datetime="Fri, 28 Dec 2012 06:20:56 GMT", ; rel="memento"; datetime="Thu, 03 Jan 2013 13:19:28 GMT", ; rel="memento"; datetime="Fri, 04 Jan 2013 12:19:10 GMT", ; rel="memento"; datetime="Sat, 05 Jan 2013 08:38:57 GMT", ; rel="memento"; datetime="Wed, 09 Jan 2013 09:44:17 GMT", ; rel="memento"; datetime="Wed, 16 Jan 2013 23:39:57 GMT", ; rel="memento"; datetime="Wed, 23 Jan 2013 22:23:46 GMT", ; rel="memento"; datetime="Fri, 08 Mar 2013 15:08:01 GMT", ; rel="memento"; datetime="Sat, 09 Mar 2013 02:33:50 GMT", ; rel="memento"; datetime="Sat, 20 Apr 2013 08:26:37 GMT", ; rel="memento"; datetime="Sat, 20 Apr 2013 09:07:21 GMT", ; rel="memento"; datetime="Sat, 20 Apr 2013 19:37:56 GMT", ; rel="memento"; datetime="Mon, 22 Apr 2013 07:37:07 GMT", ; rel="memento"; datetime="Sat, 08 Jun 2013 12:18:08 GMT", ; rel="memento"; datetime="Wed, 07 Aug 2013 09:33:21 GMT", ; rel="memento"; datetime="Sun, 08 Sep 2013 14:42:36 GMT", ; rel="memento"; datetime="Sat, 28 Sep 2013 00:11:44 GMT", ; rel="memento"; datetime="Sat, 19 Oct 2013 03:40:11 GMT", ; rel="memento"; datetime="Sun, 20 Oct 2013 00:51:13 GMT", ; rel="memento"; datetime="Sun, 20 Oct 2013 08:19:55 GMT", ; rel="memento"; datetime="Fri, 01 Nov 2013 00:17:23 GMT", ; rel="memento"; datetime="Sun, 08 Dec 2013 03:22:37 GMT", ; rel="memento"; datetime="Mon, 09 Dec 2013 19:11:58 GMT", ; rel="memento"; datetime="Fri, 20 Dec 2013 17:01:05 GMT", ; rel="memento"; datetime="Tue, 24 Dec 2013 22:19:04 GMT", ; rel="memento"; datetime="Sat, 04 Jan 2014 20:17:27 GMT", ; rel="memento"; datetime="Fri, 10 Jan 2014 10:11:50 GMT", ; rel="memento"; datetime="Sat, 25 Jan 2014 08:11:53 GMT", ; rel="memento"; datetime="Tue, 25 Feb 2014 00:03:47 GMT", ; rel="memento"; datetime="Sat, 08 Mar 2014 21:21:13 GMT", ; rel="memento"; datetime="Sun, 08 Jun 2014 12:10:32 GMT", ; rel="memento"; datetime="Tue, 09 Sep 2014 05:31:10 GMT", ; rel="memento"; datetime="Sat, 08 Aug 2015 05:49:42 GMT", ; rel="memento"; datetime="Fri, 16 Feb 2018 09:14:05 GMT", ; rel="memento"; datetime="Sat, 17 Feb 2018 23:51:22 GMT", ; rel="memento"; datetime="Sun, 18 Feb 2018 20:00:12 GMT", ; rel="memento"; datetime="Mon, 19 Feb 2018 20:35:51 GMT", ; rel="memento"; datetime="Tue, 20 Feb 2018 21:48:48 GMT", ; rel="memento"; datetime="Wed, 21 Feb 2018 22:02:48 GMT", ; rel="memento"; datetime="Thu, 22 Feb 2018 22:23:22 GMT", ; rel="memento"; datetime="Fri, 23 Feb 2018 19:59:12 GMT", ; rel="memento"; datetime="Sat, 24 Feb 2018 21:03:58 GMT", ; rel="memento"; datetime="Sun, 25 Feb 2018 18:56:18 GMT", ; rel="memento"; datetime="Mon, 26 Feb 2018 19:37:17 GMT", ; rel="last memento"; datetime="Tue, 27 Feb 2018 19:34:59 GMT", ; rel="timemap"; type="application/link-format", ; rel="timemap"; type="application/json", ; rel="timemap"; type="application/cdxj+ors", ; rel="timegate"
2018-04-25 update: As noted above, Peter Sterne brought to my attention that the non-standard URL of www.blog.reidreport.com/robots.txt still exists (and is blocking "ia_archiver") even though the more standard blog.reidreport.com/robots.txt is 404. Another 2018-04-25 update: The NYT has covered the story ("MSNBC Host Joy Reid Blames Hackers for Anti-Gay Blog Posts, but Questions Mount"), and there was an interview with Reid's computer security expert ("Should We Believe Joy Reid’s Blog Was Hacked? This Security Consultant Says We Should"), Jonathon Nichols. I embed a statement from Nichols (released by Erik Wemple), and a tweet from Nichols clarifying that they were not suggesting that Wayback Machine's mementos were hacked, but rather the hacked blog was crawled by the Internet Archive. This is where it's important to note that there maybe a discrepancy between the posts that Nichols is concerned with and those that @Jamie_Maz surfaced. There is (semi-)independent evidence of @Jamie_Maz's pages, with the ultimate implication that for those pages to have been the result of a hack, blog.reidreport.com would have had to been hacked as many as 12 years ago -- and for nobody to have noticed at the time. Reid (& Nichols) could always unblock the Internet Archive and share the evidence of the hack. 3) we said "Yo! Does your hack look like our hack!?" 5) We THEN got new data that showed it wasn't a hack of any archive. Thanks to Prof. Weigle and Mat Kelly for providing examples of some of the URLs that are slipping through the robots.txt exclusion. 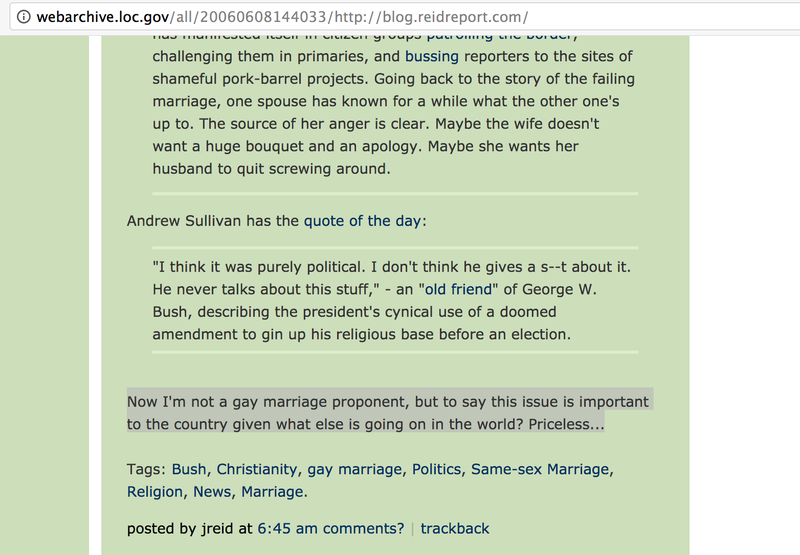 4/x Joy writes a blog post about John Roberts’s son, links to some articles, and makes joking comments about him. 29 hours 49 minutes 38 seconds, or 1 day, 5 hours, 49 minutes, 38 seconds. Call it 30 hours. It's possible that the blog's timezone was GMT, so the interval would become 35 hours. It's also possible the timezone was PST (Blogger was a Google service in 2006, so there's a good chance the machines were in CA), then the window shrinks to 27 hours. But EST and 30 hours is a pretty good guess. Blogger does allow you to change creation dates on blog posts, so it is possible to go into a blog "today" and author a post that was "created" in 2006. But the Internet Archive saw what it saw on 2006-01-11T22:17:38Z, so if the blog was hacked and posts were backdated to appear as 2006-01-10, then a hacker would have to have logged into the site and posted content without Reid or her readers noticing. 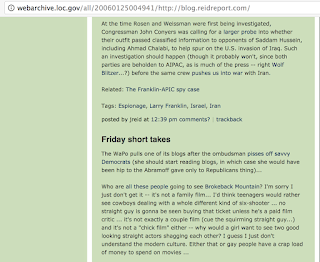 The archived page shows six posts on January 11, 2006, 12 posts on January 10, and 11 posts on January 09. Even if we accept the premise that some of those posts are fraudulent, it is clear that Reid was a prolific blogger and regularly interacted with the blog (history note: blogging was very popular before Twitter & Facebook all but replaced it some years later). 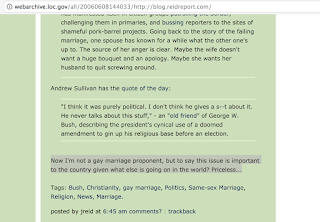 I don't know what kind of readership Reid's blog had in 2006, but at the very least she was interacting with it many times per day, and would have had occasion to notice posts that she did not author. In other words, the window for the last time that Reid interacted with the blog and when the blog was archived is less than 30 minutes. 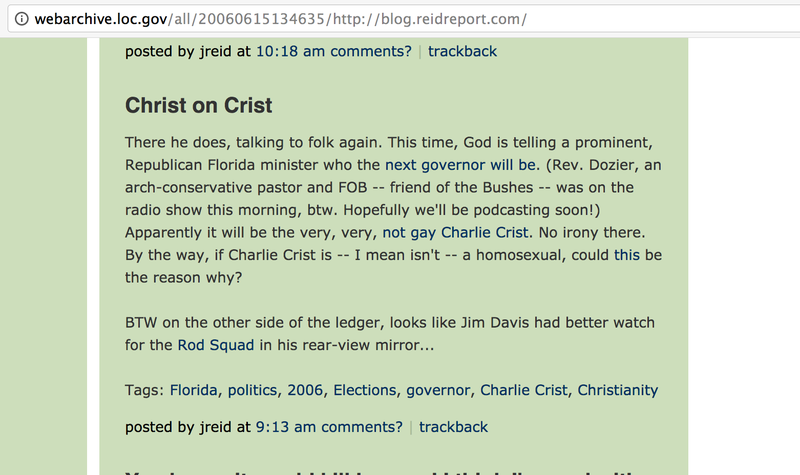 It's entirely possible that Reid pressed "publish" and did not look back at the blog, and just moved on to the next task. It's also possible that an adversary logged into the blog, posted the content before the 2006-01-11T22:17:38Z archival time, and changed the creation date to be earlier in the morning, before the presumably legitimate content was published. But also keep in mind that such an adversary would not know in advance the time that the Internet Archive would visit the page (IA's "save page now" did not exist in 2006). 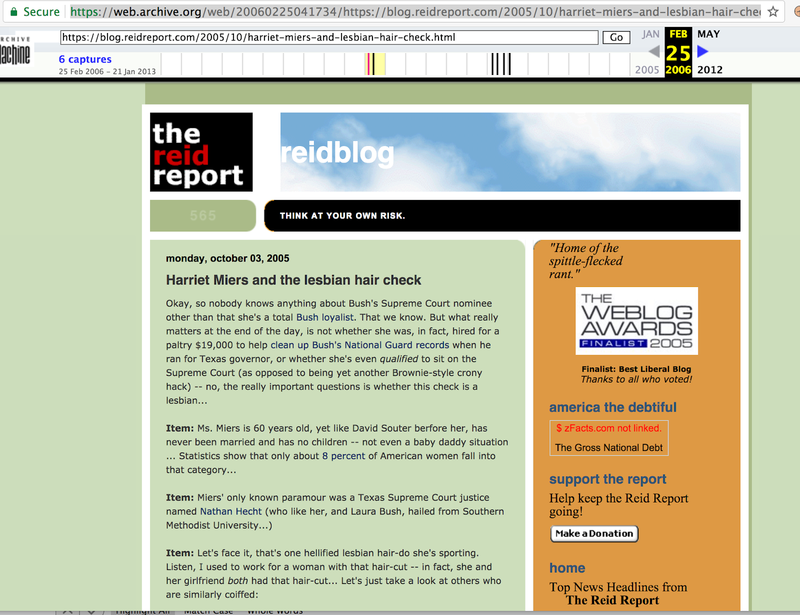 In summary, while we can't rule out an external adversary logging in and inserting fraudulent content right before archiving time, it would take an extraordinary set of circumstances for the content to appear before the page was archived and not be noticed by Reid (or brought to her attention by her readers). I'm including a twitter thread here in lieu of a proper write-up. 2018-04-23: "Grampa, what's a deleted tweet?"